Buying E&O insurance is not most agents’ favorite activity. You need coverage in order to write business through sales intermediaries and insurers. You have a sense of how much you need and what you’re willing to spend. But you don’t want to spend a lot of time researching products or getting quotes. You just want your certificate of insurance . . . yesterday! So when an E&O marketer offers to beat any competing product by 10 percent, you may be inclined to buy without doing your research. Big mistake. First, risk-sharing plans pool customer money. But they’re not insurance because there’s no statutory requirement to actually make good on customer claims. If the plan runs out of money, claims will go unpaid. Second, since risk-sharing plans aren’t insurance, state insurance departments have no jurisdiction over them. Thus, if the plan defrauds an insured or screws up claim processing, agents will be out of luck. Third, since risk-sharing plans aren’t insurance, they’re not required to disclose whether their assets are sufficient to cover liabilities. Plus, insurance departments lack power to declare them insolvent or to manage their rehabilitation. Fourth, since risk-sharing plans aren’t insurance, the ratings agencies don’t evaluate them. This means buyers will have no access to solvency data. Say “coverage,” not “insurance”. If you never see the word “insurance,” it’s fair to assume it’s not insurance. Refer to “initial out of pocket” instead of “deductibles.” Again, since risk-sharing plans aren’t insurance, they can’t use insurance terms. Mention a privately held ownership structure. Not only are risk-sharing plans exempt from insurance-department financial reporting, being closely held allows them to keep their finances private. Disavow future responsibility. As one such plan discloses, “it may discontinue (the) company and all of its operations, to include the validity, renewability, and future claim ability on any product or service at any time, without notice.” If this were to happen, customers would not be able to transfer their claim to a state insurance guarantee fund. Again, they will be up the proverbial creek. Refer to being domiciled abroad. This means customers of these plans will have no legal recourse in a state court. Instead, they will be forced to seek relief in a foreign jurisdiction such as Belize or in U.S. federal court. In addition, every time they pay for their E&O coverage with a credit card, they’ll get hit with an international transaction charge. But here’s the most important point. If you want to stay in insurance long term, think about the benefit of having E&O Insurance coverage you can count on. What appears to be a good deal today may, in fact, jeopardize your finances in the future. Don’t be shortsighted. Solve for value, not price! 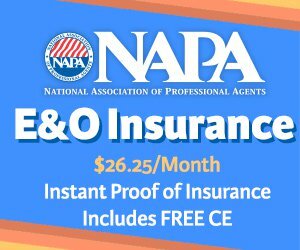 All NAPA E&O products are underwritten by A+ rated insurance carriers.